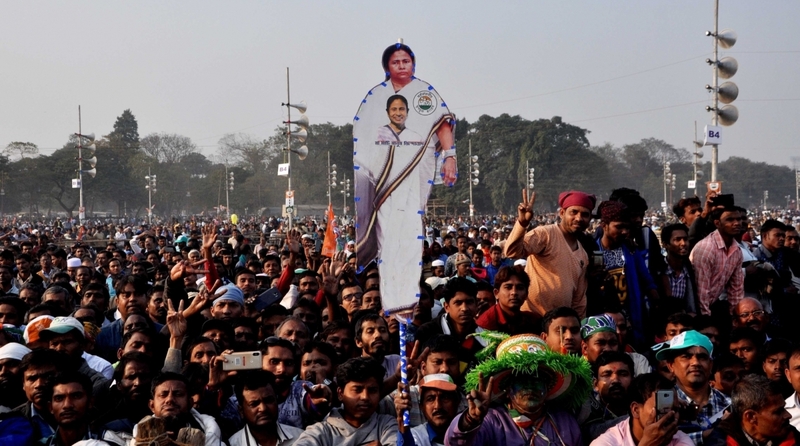 Over 20 leaders, including a former Prime Minister and three sitting Chief Ministers, from more than ten parties attended the rally on the call of West Bengal Chief Minister Mamata Banerjee. Responding to West Bengal Chief Minister Mamata Banerjee’s call, a bevy of opposition leaders from across the country, including a former Prime Minister and three sitting Chief Ministers, came together in a show of political unity against the Bharatiya Janata Party (BJP) in Kolkata on 19 January. 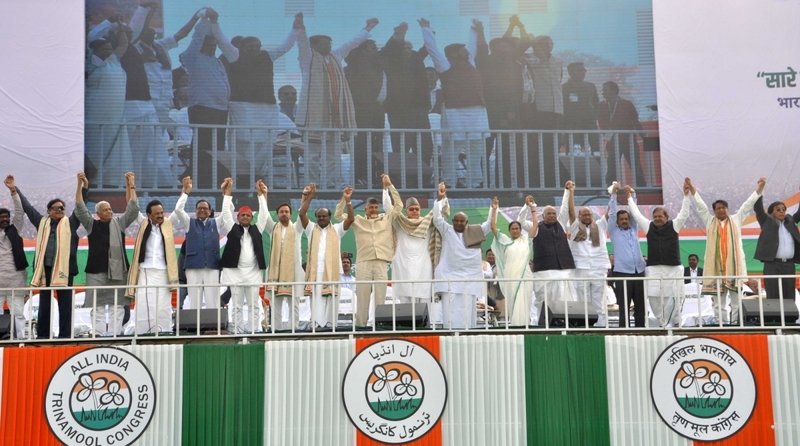 Together, the leaders presented a show of unity – the first since a similar display during the swearing-in ceremony of HD Kumaraswamy as Karnataka Chief Minister – and unanimously expressed their desire to remove the BJP government led by Prime Minister Narendra Modi. 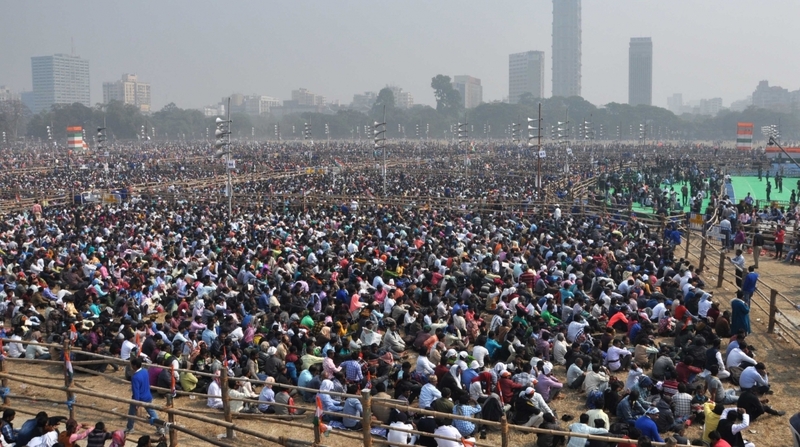 The so-called ‘United India’ rally, aimed at projecting both a federal front and Banerjee as a national leader, was held on a warm winter afternoon at Brigade Parade ground with lakhs of supporters in attendance. Banerjee, who welcomed all the leaders at the venue, had given the call for the rally late last year. The leaders included Andhra Pradesh Chief Minister and Telugu Desam chief Chandrababu Naidu, DMK head MK Stalin, Karnataka Chief Minister and JD(S) leader HD Kumaraswamy, JD(S) chief and former Prime Minister HD Deve Gowda, Delhi Chief Minister and AAP leader Arvind Kejriwal, Farooq Abdullah and his son Omar Abdullah (both National Conference), Tejashwi Yadav (RJD), Ajit Singh and Jayant Chowdhury (both RLD), former Arunachal Pradesh Chief Minister Gegong Apang, Hemant Soren of JMM, Patidar movement leader Hardik Patel, Loktantrik Janata Dal leader Sharad Yadav, Babulal Marandi of Jharkhand Vikas Morcha, Dalit leader Jignesh Mevani, Mizoram opposition leader Pu Lalduhoma, Nationalist Congress Party (NCP) supremo Sharad Pawar and Samajwadi Party chief Akhilesh Yadav. Most of the leaders had arrived in Kolkata on Friday night. Delhi Chief Minister Arvind Kejriwal said the ‘jodi’ of Modi-Shah had “done in five years what Pakistan could not do in 70 years – divide India”. “Pakistan wanted to divide India. What Pakistan could not do in 70 years, Modi and Amit Shah did in five years. 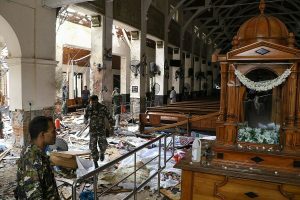 They made Muslims fight Christians, Hindus against Muslims. Their jodi will destroy India. If these two come back again in 2019 then this country will not survive,” he said in a fiery speech at the venue where tens of thousands waved TMC flags. Equating Modi to Adolf Hitler, Kejriwal said that like the German Chancellor of the Nazi era, Modi-Shah duo want to end democracy. “Hitler became the German chancellor in 1931. He then ended voting and remained Chancellor till his death. Modi-Amit Shah want to do the same. They want to end democracy,” he said. Urging the people to oust Modi-Shah, Kejriwal said that the objective of the gathering is not for PM’s post in 2019 but to remove the duo. Former BJP leader and Union minister in Atal Bihari Vajpayee’s cabinet, Yashwant Sinha slammed his former party accusing it of trying to destroy every democratic institution in the country. He also rejected the notion that the anti-BJP gathering was against one man. “Though I have left the BJP, I know what their reaction will be. They will say ‘We are here to remove one man – the man who is the PM’. I want to say that this is not the question of one man, but of a thought, an ideology against which we stand,” he said. “We know that in the past 56 months the biggest threat has been to democracy. There is no democratic institution in this country which they have not tried to destroy,” Sinha added. 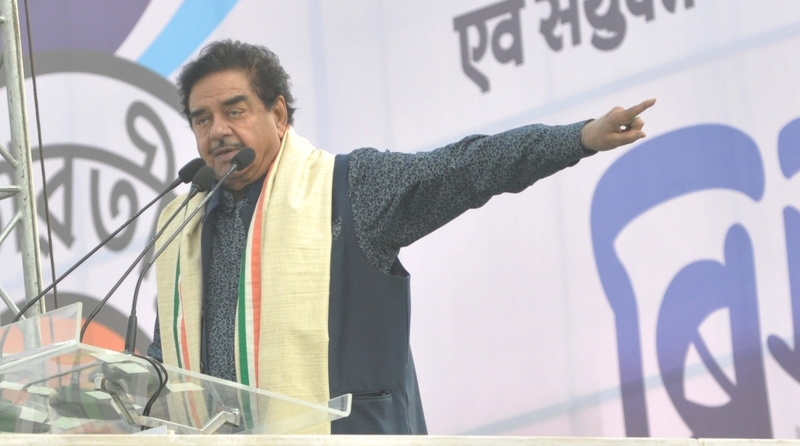 Sinha, who served as Union Finance Minister in the Vajpayee regime, said that the current BJP leadership “took sabka saath (everybody’s support) but did sabka vinash (destroyed everybody)” while raising the number of opposition accusations against the Modi government. He added that all previous governments at the Centre believed in federal democracy but the current regime is busy dividing the country. “I have been fortunate enough to work under Indira Gandhi, Rajiv Gandhi, PV Narsimha Rao, HD Deve Gowdaji, who is present here, Atal Bihari Vajpayee. All those people believed in federal democracy. But the last four years have been testing time for Indian democracy,” Apang said. Speaking in Tamil, Dravida Munnetra Kazhagam chief MK Stalin accused PM Modi of cursing the opposition leaders out of fear. “Wherever PM Modi is going he is fiercely attacking the opposition. Modi is fearful of Opposition and that is why he is also cursing us. He is afraid of our unity so we must come together to safeguard India,” he said in a speech translated to Bengali. “I can see from here the various classes of people on this ground. All of us have only one call – remove BJP, send Modi home and save nation. If we stay together, we will defeat BJP,” he asserted after raising questions on demonetisation, GST and Rafale. Stalin, who began his speech with some words in Bengali, also hailed the land of West Bengal for producing luminaries such as Swami Vivekananda, Rabindranath Tagore and Subhas Chandra Bose. He said that there are a lot of cultural similarities between West Bengal and Tamil Nadu. Abhishek Manu Singhvi said that the PM makes fun of the “rainbow coalition”. “I want to ask through you why Modi doesn’t speak of his ‘world’s most immoral government’ in Kashmir,” he said referring to the BJP’s alliance with People’s Democratic Party (PDP). “Modi’s vendetta politics is well known,” he added. In his address, Kharge said that the time to walk together has come. “I appeal that we all unite to save the Constitution and the democracy. They (BJP) are helping their corporate friends. They promised to provide two crore jobs every year, where are the jobs?” he said. On Friday, the Congress president had sent a message to Mamata Banerjee extending his support to the event hoping that the “show of unity” will send a powerful message of “a united India together” for ideas that the BJP and Prime Minister Narendra Modi were intent on destroying. “I extend my support to Mamata Di on this show of unity and hope that we send a powerful message of a united India together,” Rahul had said in his statement. The BSP was represented by SC Mishra who pointed at the loss of jobs, farmer distress and minority issues, and said that such a government needs to be uprooted to save the constitution. RJD leader Tejashwi Yadav, who arrived late at the venue, echoed the allegations levelled by Akhilesh Yadav on the ED and the CBI. He called PM Modi “the factory, manufacturer, wholesaler and distributor of lies” and said that the unity of the Mahagathbandhan is in its diversity referring to the many parties who were at the gathering. The senior NC leader also said that the objective of the grand alliance is to win the elections first. “Who becomes the PM is for later,” he added. “If speaking truth is rebellious, then I am a rebel,” he said. Sinha claimed that even Finance Minister Arun Jaitley was unaware of demonetisation. While borrowing Rahul Gandhi’s moniker for GST, who he called “kamyab adhyaksh” (capable president) Sinha said that the “Gabbar Singh Tax has undergone 366 amendments. “Traders have suffered due to GST. Our priests have had to suffer. Langar, too, came under GST,” he said. Hailing the Vajpayee government as “people’s rule”, Sinha said the current government is dictatorial. Speaking in a mix of English, Hindi and Bengali, the West Bengal CM said that Bengal has always shown the right path to the nation in times of crisis. Mocking the BJP, Banerjee said that the saffron party is leaderless. “Everybody in this coalition is a leader, worker and organiser. No need to think of the post of Prime Minister. We will think about it. We begin our meeting from here,” she said adding that collective leadership is very important. Elaborate security arrangements were in place as a sea of supporters of the political parties in attendance came from across West Bengal and beyond. The enthusiastic participants waved giants flags. Some held aloft a larger-than-life cutout of Mamata Banerjee. Notable opposition leaders not in attendance included Biju Janata Dal (BJD) and Telangana Rashtra Samiti (TRS). The TRS absence was particularly noteworthy due to the fact that TRS chief K Chandrashekhar Rao had himself met Banerjee last year in one of the earliest attempts at forging a federal front. Also not present was the Left, which is one of the most vocal opponents of the current BJP regime but is also an opponent of the TMC government in West Bengal. People were seen donning party symbols on hats and clothes.